How do you keep your kids, family, and friends happy in Halloween? 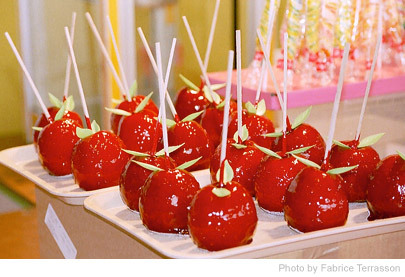 Since this spooky celebration is all about sweets and confectioneries, try creating a few delightful treats, ranging from simple candied coated apples to elaborate apple pie caramel apples, made from freshly picked apples from the fall harvest! "Pommes d'amour" by Fabrice Terrasson is licensed under CC BY 2.0. Mix the sugar, corn syrup and water in the sauce pan and heat until it boils. Insert the thermometer to ensure that the boiling mixture reaches about 300°F. Be sure to wash, dry and add sticks to the apples while you wait. When the boiling mixture reaches the temperature, immediately remove it from the heat and stir in the vanilla extract by using the rubber spatula. Then, add the white food coloring and another gel coloring of your preference, and stir gentle until the color is evenly blended into the mixture. Dip your apples in the mixture while it is still warm to get an even coat of sweets. Set the apples down on a cookie sheet sprayed with non-stick solutions and wait till it hardens. Using your knife, cut an opening on the top of the apple that is just big enough for you to insert the stick in. Wrap the stick with a freezer bag before you put the stick into the apple. Place the caramels in a microwave safe bowl and add 2 teaspoons of water. Heat the caramels in the microwave in 1 minute intervals, stirring each time until the texture is smoothed out and runny. Dip your apples in the puddle of caramel and let the excess drip before setting it down on a baking sheet. Melt the orange candy melts according to the instructions on the package and dip the caramel coated apples in the mixture. If you want the design to resemble an actual pumpkin, use the back of a spoon dipped into candy melt and push down vertically on the apple to create streaks. Place in the fridge to set. And now you have apples that taste like candied apples but look like pumpkins! "Homemade apple pie apple" by Joy is licensed under CC BY 2.0. Sash and dry your apples so that your caramel can stick to the apples. Melt the caramel in a saucepan until the mixture is smooth and runny. 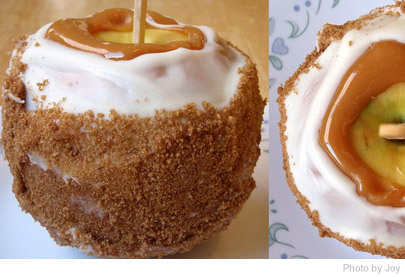 Put the Popsicle sticks into the apples and dip into the caramel. Place the apples on the wax paper lined with butter spray and let the caramel set. Melt the chocolate chips in the microwave in 30 seconds intervals. You may need to add some water to it depending on how runny you want to mixture to be. Take the caramel apples out of the fridge and coat it will the chocolate mixture while it is still warm and smooth. Let the apples set for a bit before you sprinkle the cinnamon sugar on it. Let it cool in the fridge and serve up! Enjoy the spooky fun night with your family by enjoying these beloved Halloween treats! Also, share the festivity with your friends and neighbors by wrapping the apples as a gift.